After a heads up battle that lasted about two and a half hours, and a final day that lasted nearly 12 hours, Tyler Bonkowski has emerged as your latest bracelet winner! Bonkowski and his heads up opponent Brandon Demes had a roller coaster duel that saw both players holding a dominant chip lead at one point .However, Bonkowski stayed strong, even when down 2.7 million to 300,000, and battled back to claim his first World Series Bracelet and win $220,817 for his efforts. When day three began, we had 18 players, and big names such as Sorel Mizzi and Victor Ramdin started the day with hopes of winning a bracelet of their own, but fell short of making the final table. Two veterans who made the final table but couldn't make heads up play were Jeff Shulman, who busted out in 9th place, and Shawn Keller, who held the chip lead for much of the day before fizzling out in 4th place. When heads up play began, Bonkowski and Demes were literally dead even at 1.5 million a piece. After both players traded blows, Demes shot out to a big lead, and it wasn't looking good for Bonkowski. 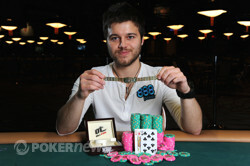 But he won back to back big pots, first when his mighty won when he rivered a pair of threes. On the next hand, Bonkowski's was good on a board, and just like that, Bonkowski was back in it. He never looked back from there, and went on to defeat Demes. On the final hand, Bonkowski and Demes got the money in on the turn with the board reading . Bonkowski had , and Demes had . The river came the , and Bonkowski claimed the victory!! Well that's it for us here at Pokernews. Be sure to tune in tomorrow as we will bring you more play by play action of every single event! Tyler Bonkowski raised on the button and Brandon Demes called from the big blind. Demes led out on the flop and got raised by Bonkowski. Demes three-bet and Bonkowski made the call as the players saw the on the turn. Demes check-raised all in and Bonkowski called as the players flipped their cards. Bonkowski had paired his kicker on the turn and Demes would need a Queen and only a Queen on the river to survive. It was not meant to be as the hit and Demes was eliminated. Brandon Demes raised preflop, and Tyler Bonkowski called. The board ran out , and Bonkowski check called on every street. 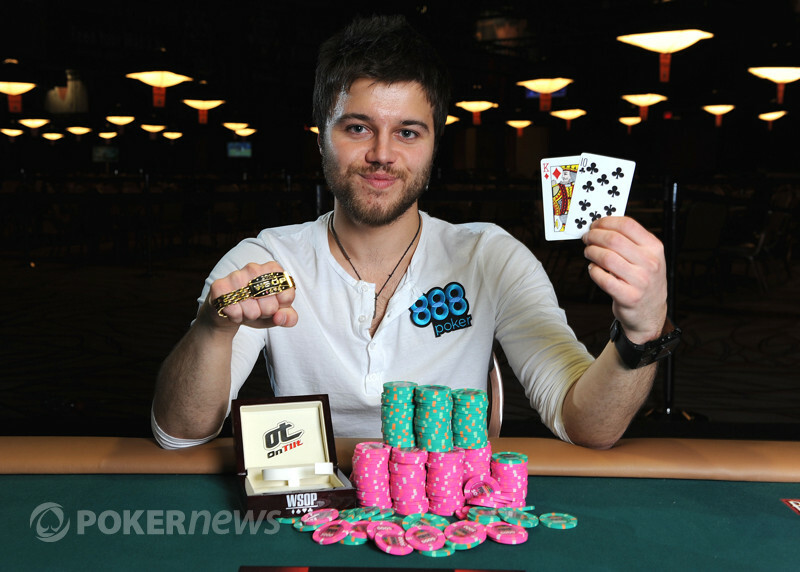 Bonkowski showed , and he won the pot to boost his chip stack back up to around 2.6 million. Brandon Demes raised preflop, and Tyler Bonkowski called. The flop came , and Bonkowski checked. Demes bet, and Bonkowski check raised. Demes wasn't concerned, as he put in a reraise. Bonkowski called, and the players saw the hit the turn. Bonkowski check called the bet from Demes. The river came the , and Bonkowski once again check called. Demes showed , and Bonkowski mucked. Demes is back up to the 1 million mark. Tyler Bonkowski was down to about 275,000 earlier in this heads up battle, and was able to fight his way back to the huge chip lead. Brandon Demes was at about 250,000 at his lowest, but now he is trying to pull a Bonkowski as it were. Demes raised preflop and Bonkowski rerasied. Demes called, and the flop came . Bonkowski bet, and Demes raised. Bonkowski three-bet, and Demes called. The turn was the , and Bonkowski bet. Demes raised, and Bonkowski gave it up. Demes is now back to about 600,000. Brandon Demes had been grinded down to about 250,000, but he just won a decent pot to start his long trek back. Demes raised preflop, and Tyler Bonkowski called. The flop came , and Bonkowski checked. Demes raised, and Bonkowski reraised. Demes four-bet, and Bonkowski folded. Demes is now back up to about 400,000. 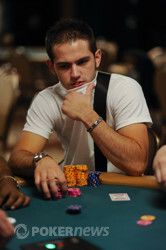 Tyler Bonkowski raised preflop and Brandon Demes three-bet. Bonkowski called, and the flop came . Demes bet, and Bonkowski raised, and Demes called. The turn brought the , and Demes check folded. On the next hand, the players took a flop of . Demes checked called a bet from Bonkowski. The turn brought the , and both players checked. The river brought the , and Demes bet out. Bonkowski raised, and Demes called. Bonkowski showed , and took down the pot to up his stack to 2.5 million.